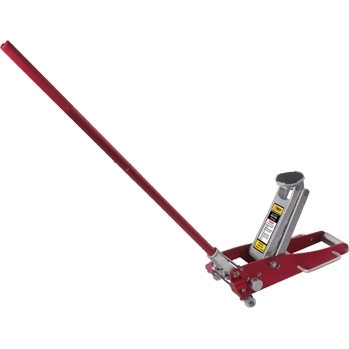 The Ranger model RFJ-3000AL Aluminum Racing Jack is made of the strongest aircraft alloy aluminum available. Not only does it weigh in at a feather-light 39 lbs., but it gets any racecar or hotrod a full 17-3/4" off the ground in just four pumps of its knurled aluminum handle. With a low 3-1/2" profile front-roller, the RFJ-3000AL is perfect for working on ground-hugging, low ground-clearance performance vehicles.